Shilmundi is a village in southeastern Bangladesh, very nearly the poorest and certainly the most densely populated country in the world. The inhabitants of Shilmundi live on the edge of poverty, for the big banks in Bangladesh -- like so many other banks around the world -- don't lend money to the rural poor. But the Bangladesh Rural Advancement Committee does. Set up to fight the overwhelming poverty of the 1970s, it's now the largest lender of micro-credit loans in the world. Three million village poor, virtually all women, take out loans of up to $300 a year, and there's a 90% repayment rate. 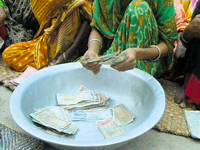 Credit Where Credit is Due recounts how taking out a loan revolutionized the lives of village women Jahanara, Bilkis, Nargis, Minara, Majeda and Shonda -- not only increasing their incomes but also helping to improve their, and their children's, health. "Whereas globalization has concentrated unprecedented wealth among the rich, micro-credit programs have stimulated inspiring self-sufficiency among those stranded by the new economy." "Shows that aid programs do not have to be capital intensive and for major projects. Instead it brings out the uniqueness and effectiveness of Bangladesh's rural credit system...A useful discussion on the socioeconomic impact of economically empowering women and the consequences for gender relations."